I made it so the “Instant” walk speed is now actually instantaneous; characters now immediately blip to their ultimate destination when they go to move on that setting (though crucially, they will still get stopped and trigger traps if they try to move over them). fixed more inventory bugs. Dropping a character’s item in the reserve supplies screen will no longer cause other items belonging to that character to spontaneously come unequipped or disappear. I’m no longer able to reproduce the inventory-swapping bug, which makes me think I may have finally (hopefully?) killed the thing. you can now right-click character portraits for detailed info when managing your reserve supplies in merchant scenes and during battle (i.e. not just during character deployment). pixeled new graphics for the steel sword, steel lance, steel spear, and steel axe so that they are visually distinguishable from the iron versions. the game now gives you visual feedback when item sacks are getting auto-looted at the end of battles that have Post-Battle Looting enabled. the game now plays a sound effect to provide audio feedback when a character’s weapon breaks. fixed a bug where decoys did not actually appear on the battlefield when using Harynx’s Decoy ability. fixed a bug where visual attack effects would show up beneath enemies whenever the attacker faced down. fixed an exploit: characters can no longer unequip speed-boosting items after they have moved. (If you undo the character’s move back to where they have taken 0 steps, you’ll be allowed to unequip the item.) This has the added benefit of sidestepping bugs that use of this exploit was causing. fixed a bug where the game would freeze if you tried to move characters whose speed had dropped below 0.
fixed a bug in which characters whose strength, psy power or psy defense went into the negatives would have those stats wrap around to some absurdly high number. fixed a bug where the game would sometimes try to degrade a weapon that wasn’t actually equipped and freeze. fixed a bug in which the game could freeze during the bridge battle if you had characters in the water, taking drowning damage right after the conversation where the enemy engineer lays explosive charges onto the bridge. 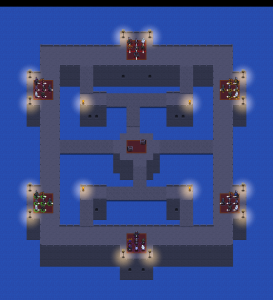 added a new 6-player multiplayer map to the game: Sunken Fortress. fixed erroneous placement of player boxes in the local multiplayer new match menu when playing maps meant for more than 4 players. fixed a sorting issue in the local multiplayer view army menu that placed the “Remove Unit” text above the Add Character drop-down. fixed a bug that was causing the game to lock up when capturing the flag in a local multiplayer free-for-all capture the flag match. applied missing lighting to braziers, candelabras, and lamps in the “Default” and “Bases for Generals” local multiplayer rulesets. added ambient sound effect loops to certain maps that were missing them. put in some extra code to automatically stop sound effect loops playing in the background when a local multiplayer match ends. new condition: Attack Bridges. Can be true or false (true by default). Tells the AI whether to treat player-built bridges as an attack target. Attack bridges set to false in the outdoor battle escaping the bandit fortress. added score bonuses for prematurely eliminating Gulch and Fera during those battles in which they’re supposed to be all but untouchable. added monologues to Gulch and Fera if you take them out during the second battle escaping the bandit fortress. added coins to more of the enemies in the outdoor bandit fortress escape battle so the player will be in a better position to reequip when Gonif Bastid shows up two battles later. put a turn time limit on the battle at Adelbrae so you can’t just exploit it endlessly for experience (or spend absurd amounts of time trying to loot every chest). updated the objectives text for the battle at Adelbrae to more accurately reflect its win conditions. switched the order of the two cut scenes following the battle at Adelbrae; the story flows more naturally that way. the game now creates a human-readable document with a .TTsav file extension whenever it saves the game, then saves that document in Documents > My Games > Telepath Tactics > Saved Games. You can open it with any text editing program; it lets you see all of the data that went into the actual saved game file (though it is not actually the save file itself). This will help me fix bugs. Phew! That was a lot of stuff. I’m now ready to get started on performance improvements–that will be my focus this weekend. Until next time! This entry was posted on Friday, May 8th, 2015 at 8:14 PM and is filed under Game Updates. This post is tagged patches, Telepath Tactics. You can follow any responses to this entry through the RSS 2.0 feed. leave a response or trackback from your own site.